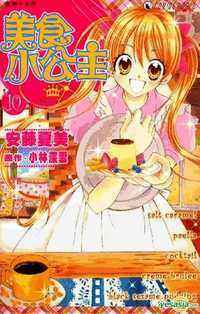 Sequel: Kitchen no Ohimesama: Tenshi no Cake wo Sagase! Najika has an outstanding talent for cooking. She happily cooks for all the other orphans she lives with, bringing on the smiles she loves to see on their faces as she also helps the old lady who takes care of all of them. As she grows older, she becomes determined to find her mysterious Flan Prince. Following her only clue, the silver spoon from Seita Academy, she enrolls the prestigious school. Will she find her Flan Prince? Can he be one of the two brothers she meets in the school? Will she beat all the cooking challenges and become a famous chef? Very pretty art. Shoujo style. Najika is not a very deep or bright character and is, essentially, your typical shoujo girl: always trying to smile and making people do the same through her cooking abilities. But she is ok, I guess. She’s not specially annoying and she has this childhood tragedy to add dept to her cahracter. Daichi and Sora are the brothers and the main competitors for Najika’s love. They are actually pretty different as Sora is the student president and a role model student while Daichi is a rebellious teenager who holds a grudge against his family and specially his father, who happens to be the director of the academy. Of course, the reasons for their tense relationship will be revealed. I like the brothers and the story behind them. Najika. She could have been a more interesting character with a better developed personality, but as I said, she is not that annoying. I thin it’s quite predictable who the Flan Prince is… But you may be confused, so it’s not totally bad. Some questions unanswered such as why Daichi stopped playing basketball. 8’5 out of 10. I enjoyed it quite a lot. I was surprised because I was expecting a lighthearted story, but then there were a few times I almost even cried!